Plants should be moved into larger containers as they grow. Unless more space is provided for the plant's roots, they can become pot-bound. That is, the roots of the plant become cramped and form a tightly packed mass that inhibits growth. How Do You Know if a Plant Needs Repotted? If the plant seems to stop growing or has slowed growth, it has likely become pot-bound. If it's a small plant, turn the pot on its side and ease the plant out of its container. Take a peek at its roots. Are they coiled in the bottom of the pot? If so, it's definitely time to repot. 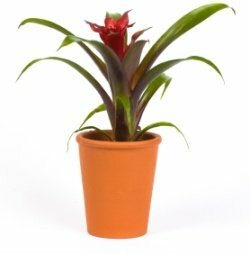 Young, actively growing house plants should to be moved into slightly larger pots with fresh potting mix once a year. Repotting house plants that are large, such as ficus, or slow-growing plants can be done every two years or when they seem to outgrow their pots or look top-heavy. If a plant is thriving, you can assume it is happy in its pot. It's a good idea to repot a plant at the beginning of a period of active growth, usually in spring. 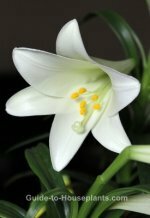 Repotting house plants that bloom in winter should be done in early fall, after their dormant period. The new pot should be no more than 2 inches wider at the rim -- or 2 inches deeper -- than the old pot. Why? A pot that's much larger gives the roots too much space to grow into. The top of the plant won't grow until its roots begin to fill the container. A too-large container will also hold too much water and can cause root rot. And while I'm on the subject -- be sure to choose a container that has drainage holes to allow excess water to escape. Check out Pots and Containers if you want more information on choosing containers. Scrub used pots between plantings to remove any diseases. You can disinfect a pot by soaking it in a solution of one part chlorine bleach to nine parts water. Rinse well with clear water. If you're using a new terra cotta pot, soak it in water for a few hours before you plant in it. New terra cotta is so dry that it will rob moisture from the soil leaving the plant thirsty. To remove the plant from its original pot, turn it on its side and ease the plant gently from the pot. If the plant won't budge, you may have to tap the bottom of the pot on a hard surface to loosen it. 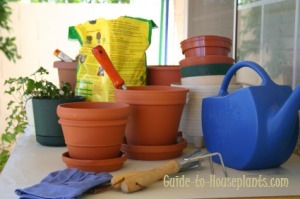 Or slide a trowel or knife around the inside of the pot, taking care not to damage the rootball. If the roots are coiled around the bottom, use your fingers to pull them straight. Prune the roots before potting. Pruning will stimulate new root growth and help the plant establish in its new container. Partly fill the new container with potting mix. Center the plant in its container, then fill the sides of the plant with additional mix. Tamp it down with your fingers, especially around the sides of the pot. Water thoroughly to moisten roots and to settle potting mix. Add more mix if needed. Do not expose it to direct sun right away because sun can be too harsh on a weakened plant. Keep the soil evenly moist, but not soggy. If you notice that the leaves are limp, the plant is not getting enough water. If the leaves turn yellow, it's getting too much water. High humidity sometimes helps a newly repotted plant recover. 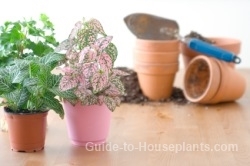 Take a look at these tips for raising the humidity for your house plants. Never fertilize a newly repotted plant. Its roots have likely been cut and can suffer from fertilizer burn. Wait at least a month before fertilizing when its root system is better established.